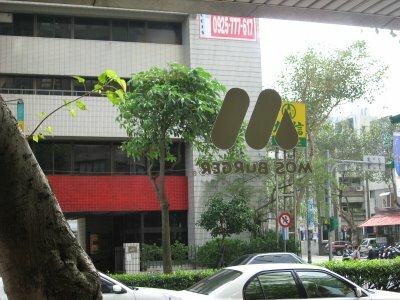 You've probably spotted the red and white M logo somewhere on the street or in a food court if you wandered Taipei enough. 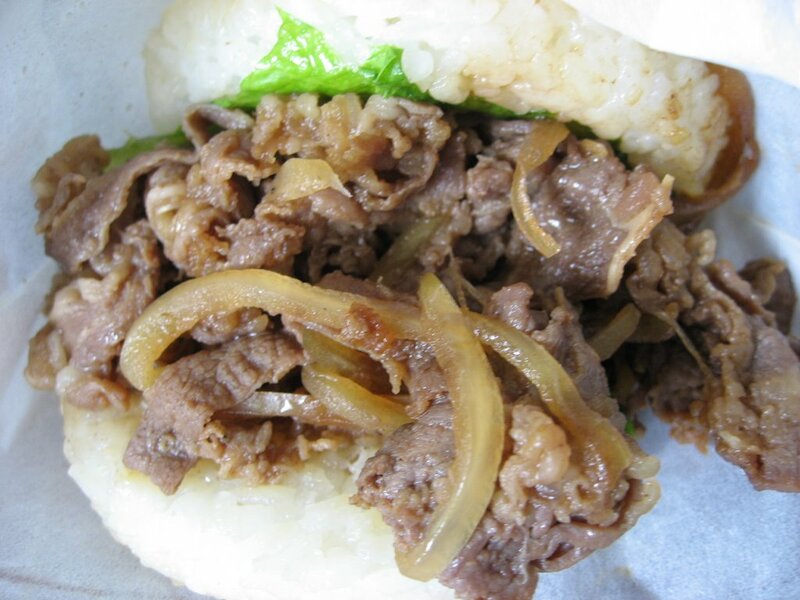 The concept for their most popular burgers is actually pretty straightforward- it's like a teriyaki beef bowl masquerading as a burger- instead of a bun, you get rice smushed into two compact patties surrounding your filling (choose between beef, chicken, pork, seafood or vegetables.) To fill out the menu, there are fries, hot dogs, fried chicken or shrimp sides, dessert and regular hamburgers. On this day, we hit a small shop on Min Sheng East Road for a to-go order for our whole family. We got there a bit before 12 noon on a Saturday, so we didn't have to wait long to order.. but we did wait quite awhile for our food because the cashier left some of the burgers off our order after my uncle used a coupon and they started to get busy with the lunch rush. When we finally got our food, our chili dog (NT$65) was just a hot dog (NT$55). We asked for them to put on some chili (and offered to pay the difference), but they firmly denied our requests by saying it "wasn't possible" nor could they give us chili on the side. 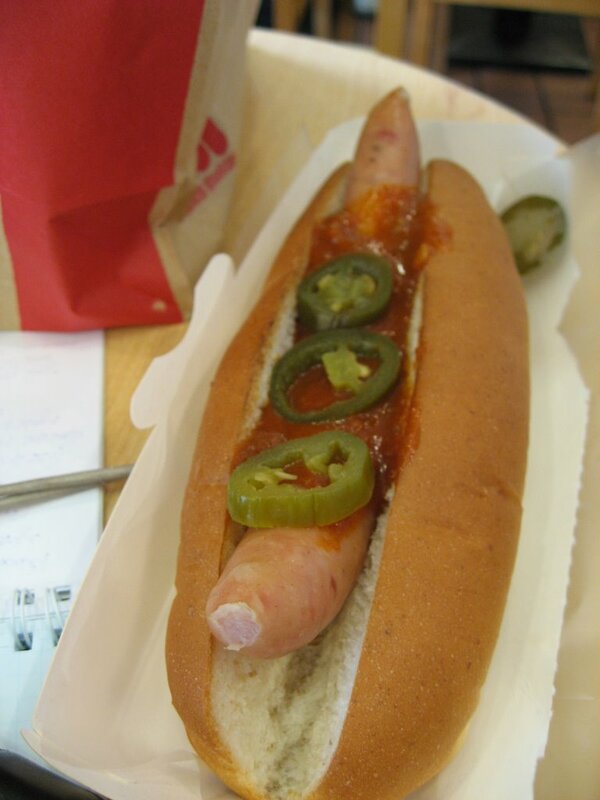 After some nagging, they made us a new chili dog which was just a tiny bit of chili spread on the hot dog with some jalepenos on top. (You'd be better off with the hot dog from Costco). The best bet is to stick to the basics- the Yakiniku beef burger (NT$65). 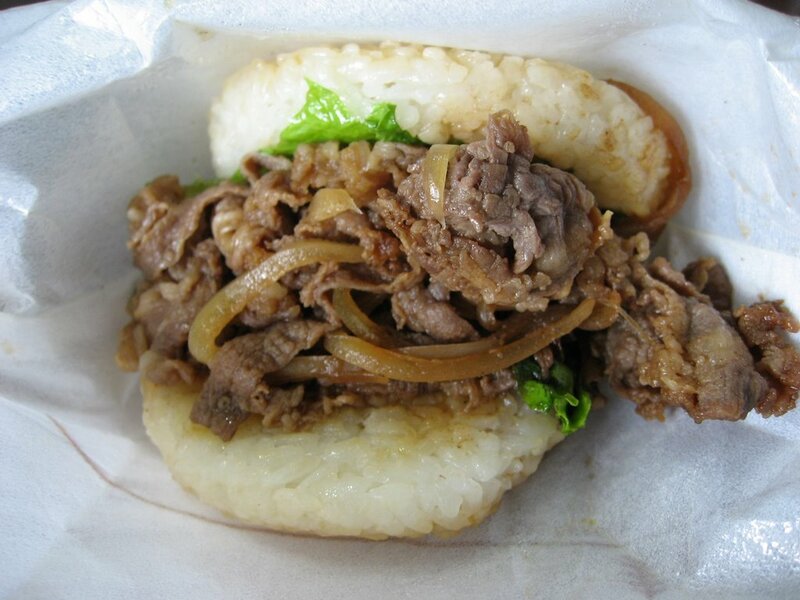 It is thin slices of beef marinated with sweet teriyaki-like sauce, and the grilled beef is tender though I think the ratio of beef to rice could be improved with more beef. I always seem to have rice leftover. 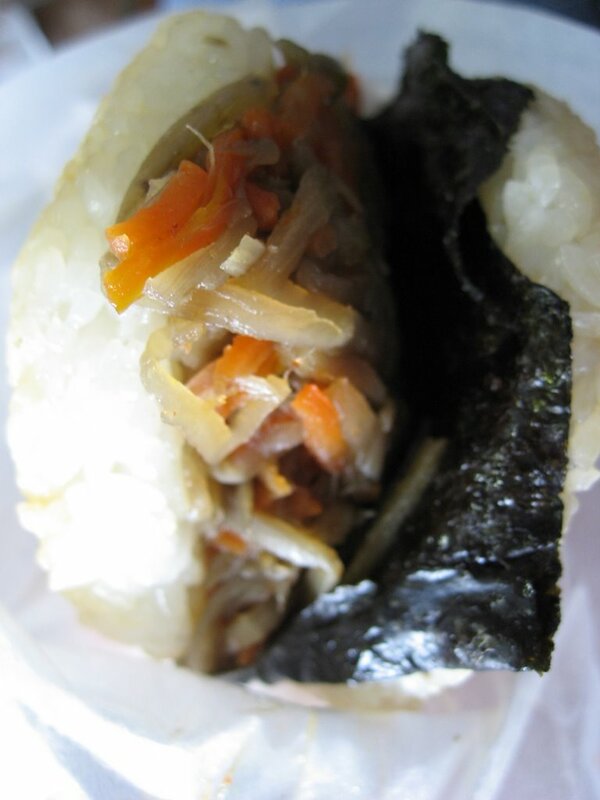 The rice patties are supposed to be grilled, although they don't have a crunchy edge and end up soaking up the juice and falling apart into the wrapping. I also like the Kinpira burger (NT$60), which has sauteed burdock, carrots, bamboo shoots, a piece of nori seaweed and a kick of spice with the Kinpara style sugar and soysauce. 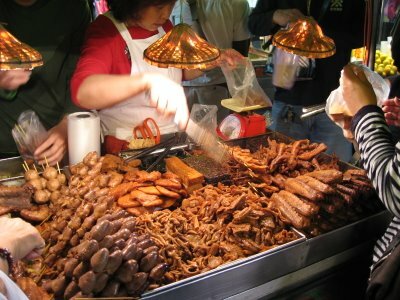 I wouldn't bother with the fried shrimp (NT$55) or chicken (NT$52) - they are a bit stale and overfried, probably fried from frozen goods. The flavor of the fried chicken was not bad, but it was just not worth ordering again. 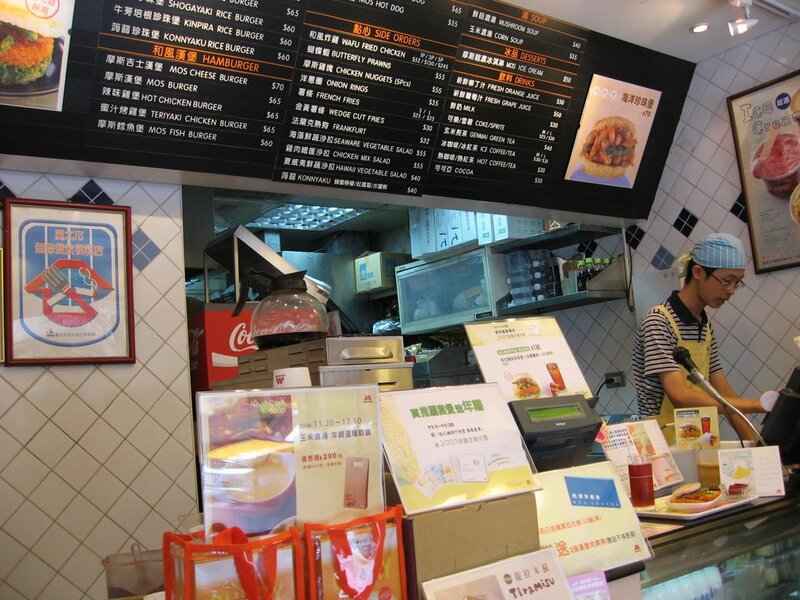 I tried the seafood burger (NT$70) a few years ago and also didn't care for it. They also have fried cutlet burgers and new burgers every so often. I think the reason why Mos Burger works is because people who love rice can eat it on the go, rather than having to sit down with chopsticks. 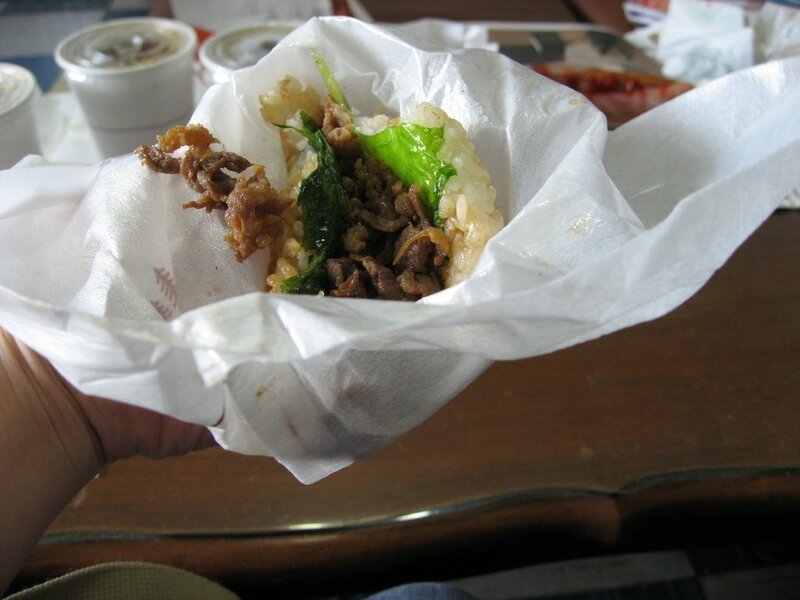 The packaging and design is even made for eating it on the go- the thin styrofoam wrapping is easily unpackaged and creates a pocket for you eat and try to keep the mess contained. It feels a tad healthier than eating a burger, although I think the size of the burgers is small. You might need two or three burgers to fill up if you were pretty hungry. (On this lunch, I had a Yakiniku and a Kinpira (leaving some of the rice behind) and was still a little hungry) It's pretty clean and nice inside for a fast food place though I'm sure each location is different. Also, if you love Mos Burger enough to eat it often, you should buy a pack of gift certificates because with NT$1000, you can get a few coupons for free burgers. This location has menu items listed in English, though it's hard to know what "Shogayaki" or "Konnyaku" burgers are if you have never eaten there before (Shogayaki is ginger pork and Konnyaku is firm jelly that is high in fiber) according to a quick google). There are menus with pictures on the wall, but not with English subtitles. So you will probably just point at the ones that look good at the counter if you don't speak Chinese. Although it's a chain from Japan, it's often one of the "must-try" items on a list of touristy things to eat in Taipei (which I've found include Mr. Donut (another Japanese eatery), Din Tai Fung and night market food). The concept of rice patties and yakiniku beef is popular enough to be co-opted by the local McDonalds, although I have to say I haven't tried the ones at McDs yet. At prices under NT$60-$100 (or ~US$2-3), it's definitely affordable to try at least once to see if you like it, although portion for price, I think you can get better values with your local food court, although it won't be as easy to eat on the run. It's so great having relatives in town because it gives me an excuse to go out to my favorite touristy spots, and sometimes even go somewhere new. 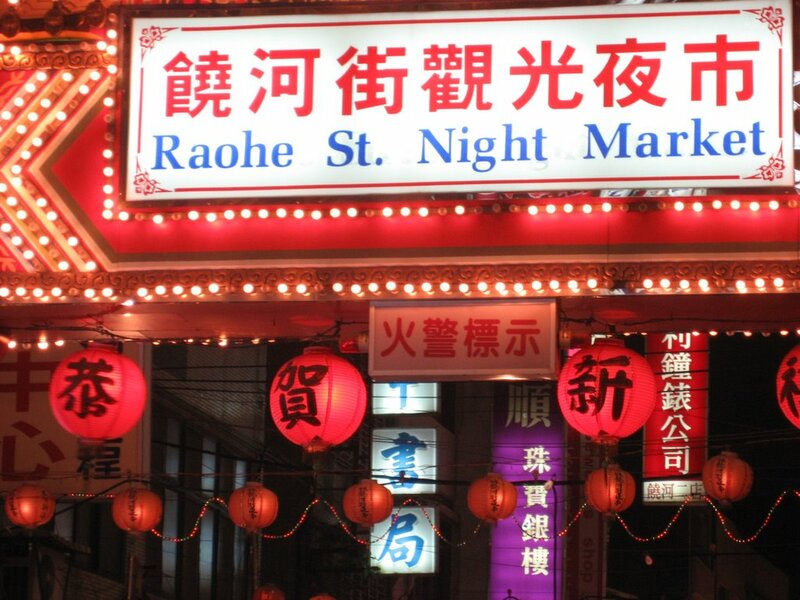 I had never been to the Raohe Street Night Market, but my mom says it is a favorite of my dad and grandparents. Heading into the entrance, we almost got lost in a group of Japanese tourists. We went after dinner around 830pm or so on a Saturday night and it was crowded, but not like Shih Lin night market where you barely have room to move. 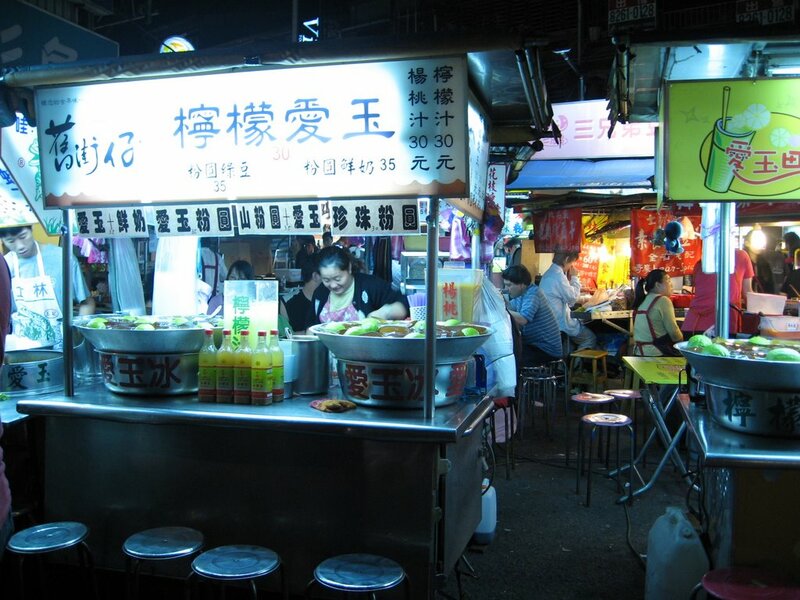 There are the typical Taiwanese small eats- oyster omelettes, herbal soups, stinky tofu, roasted corn, food on sticks, fruits, candies, noodles, as well as some unusual treats. I didn't get the chance to try it- but they had something I'd never seen before- a super long curly chip, basically a spiral carved out of a potato and deep fried. 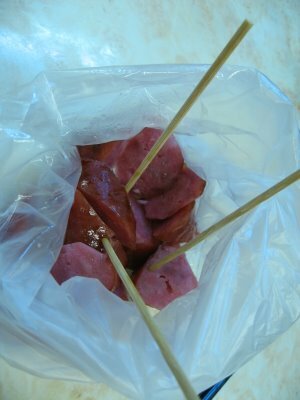 They place it on a stick for you to eat and season it with your choice of seasoned salt. 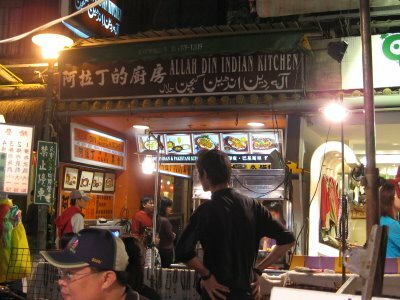 I did get to try a lamb wrap (NT$80) from the Allah Din, after spotting their grilled kabobs, which was fairly close to the entrance. The guy making the kabobs called out to the crowds in Chinese to try it and spoke a little English as well. 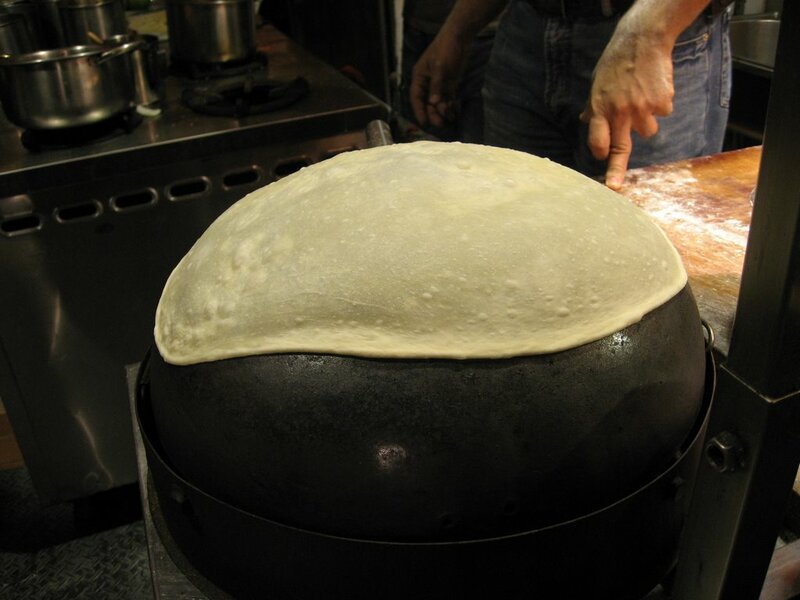 They "baked" the fresh paratha (Indian flatbread) and you could choose lamb, beef or pork for your filling. The signs were only in Chinese and I ordered lamb, thinking I'd get the kabob. 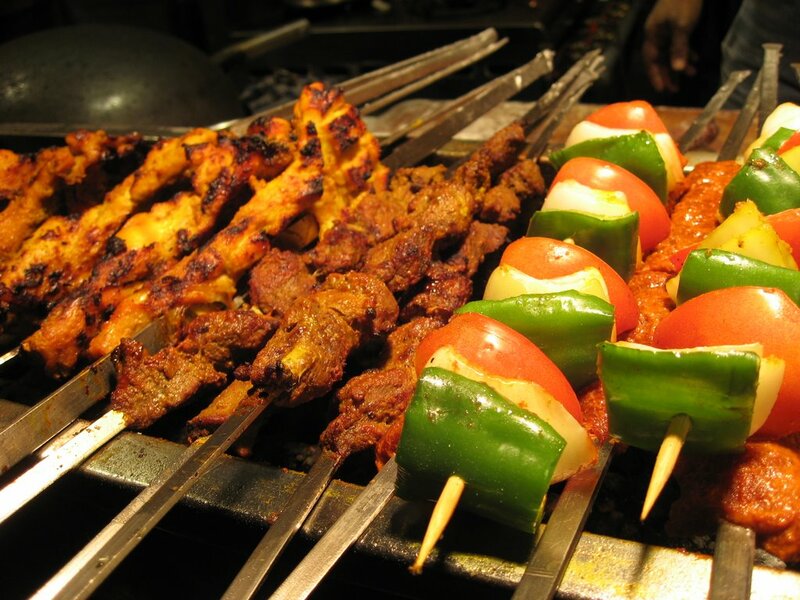 To my surprise, I got minced lamb to which I tried to tell them that I wanted the kabob meat. They said that what they were giving me was better and that I didn't order the kabob, I ordered the wrap, even though I saw them wrapping a chicken kabob meat in the wrap for someone else. I ended up just deciding to try it. It was not bad- it was warm and spicy. 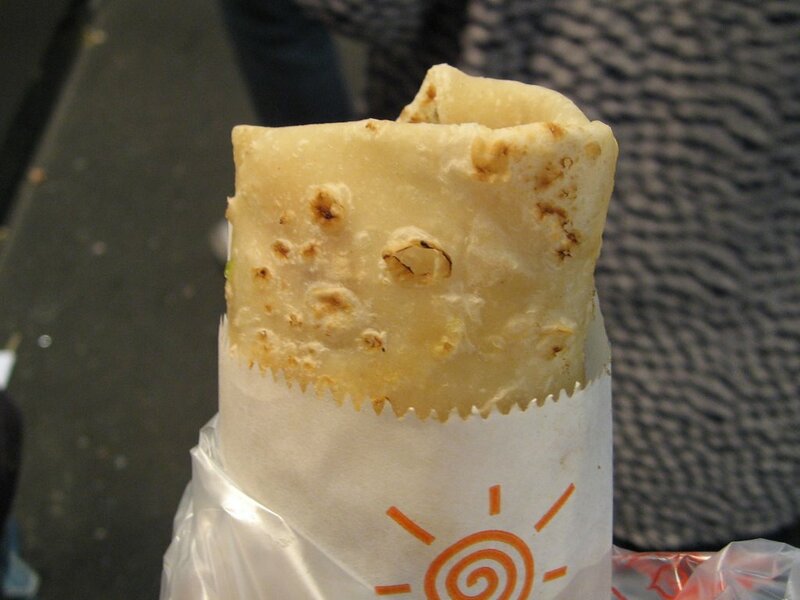 The paratha (Indian flatbread) was chewier than naan which is usually crispy and chewy. 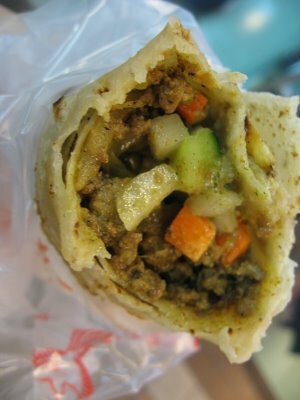 They added pickled carrots and cucumbers which gave it a nice crunch and added the green sauce which gave it some heat. 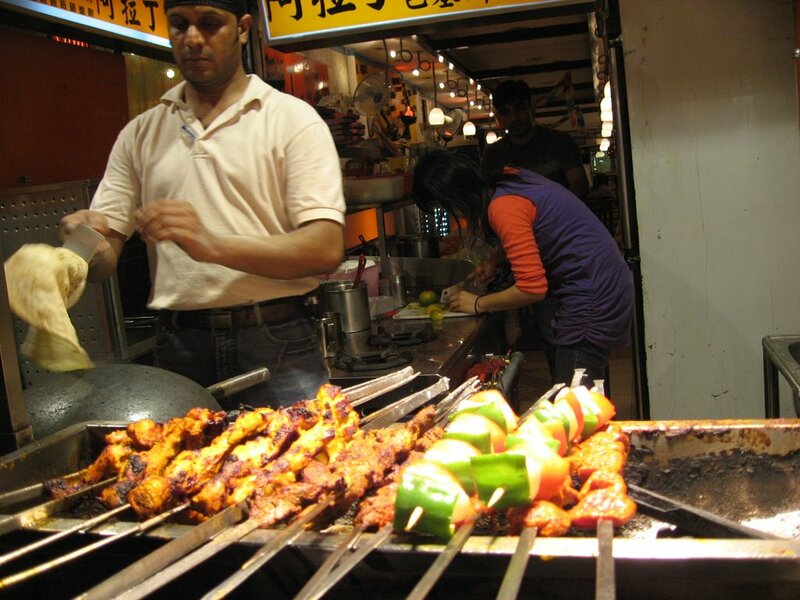 I would love to try the tikka chicken next time. There's also seating in the back, if you want to sit down and order a plate. I've never seen this in the states, but I've seen it at the Shih Lin night market as well (with English signs). The guy at Shih Lin also has more room to toss up his paratha bread (kind of like pizza throwing) which usually draws a crowd. I also shared some shaved ice (NT$50). If you've never had shaved ice, you can usually choose up to four toppings from an assortment of toppings or just choose one. My sister liked the powdery texture of the ice, sort of like eating fresh fallen snow. 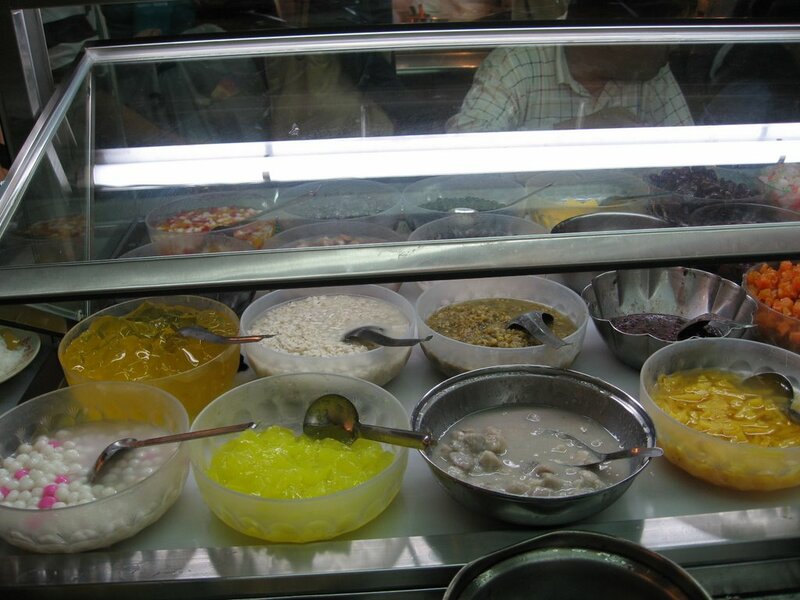 choose from toppings like lemon jelly, grass jelly, rice mochi balls, boba balls, fruit, peanuts, red bean, green bean, pudding, taro, passion fruit sauce and more! Although the ice wasn't enough for us, the owners gave us more shaved ice when we asked for it without any trouble. One of the women who worked there was very pregnant and it turned out she was five days away from her due date. We chose boba, rice mochi balls, aiyu lemon jelly and red bean with evaporated milk on top.They also served sweet tofu dessert and a crispy flaky looking dish. does anyone know what this is? salty or sweet? If you don't eat your shaved ice fast enough, especially in hot weather, it will melt into a puddle like this. 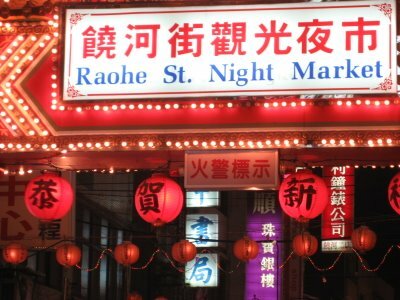 Once you walk into Raohe night market, you basically walk down a LONG row of eateries and shops until you exit the other side. 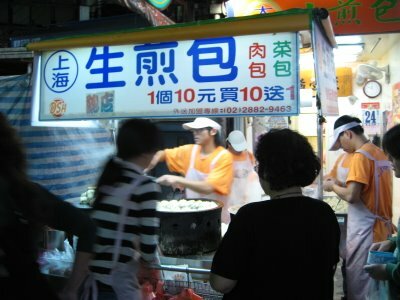 There's also quite a few NT$10 shops so you could end up with a bag full of things before you leave. Come with an empty stomach and you can hop around the different stands to find your spot to sit among the crowds. 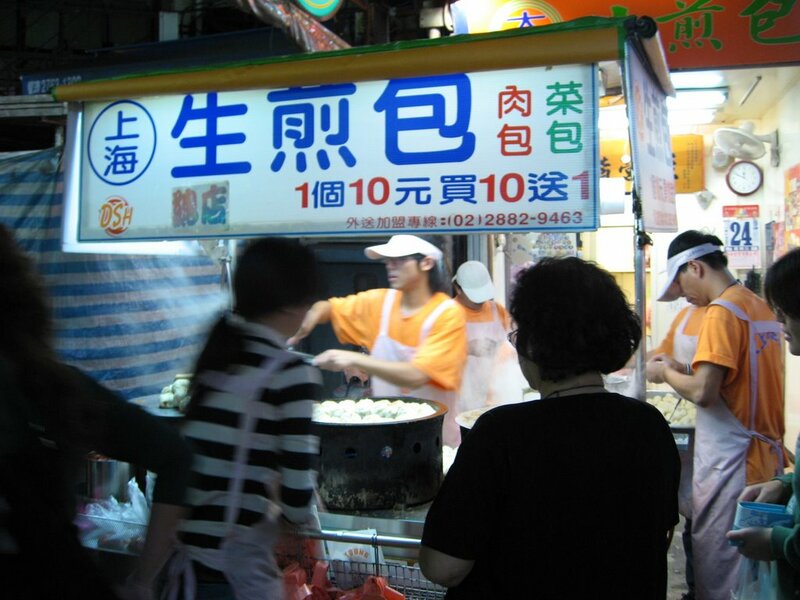 Back in the 90s when I used to be a visitor rather than a part time resident of Taipei, I would always make sure to visit Shih Lin night market sometime during my trip. There is so much to see, eat, shop- you could spend all night fighting the crowds on a busy weekend night and not even cover half of it. One of the most popular destinations to buy souvenirs and bargain for goodies and eat everything and anything- it can also be a great people-watching spot as you'll find everyone there- students, families, couples, tourists. 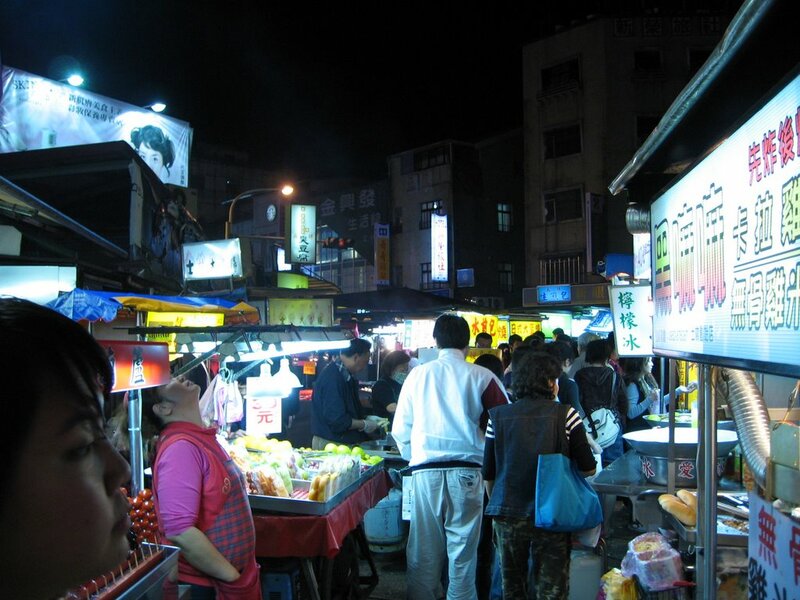 But you can also find lots of cheap good eats inside the main section of the night market- specifically the side near the movie theaters where there is a cluster of stands and shops, which is where we went on this night. 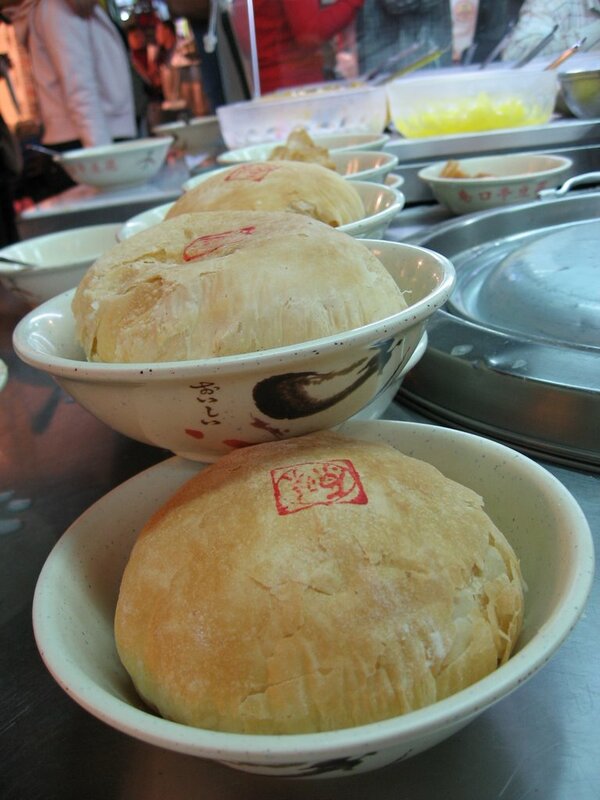 One of my favorite snacks is the pan fried dumplings (NT$10)- first steamed in this giant pot and then the bottom is fried to a delicious crispness. 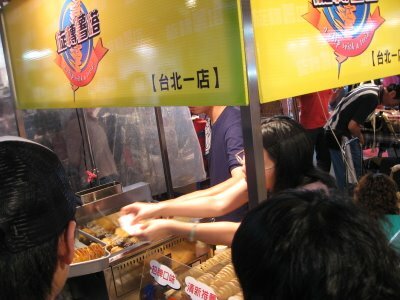 I think that the prices are the same as when I first ate them almost 10 years ago! There are about 3-4 bao places- they are all pretty good, but there is one located next to the shaved ice place that usually has a line which is my favorite. The bao is almost too hot to hold and thankfully it's too big to eat in one bite so you can enjoy all the bites after the first. 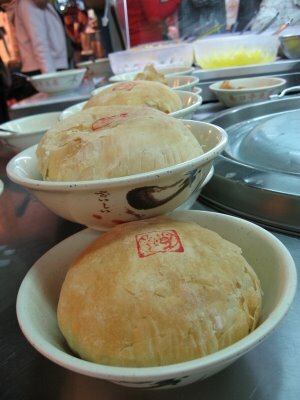 The skin is thicker than xiao long bao, with a steamed doughy texture accompanied by the crispy bottom. 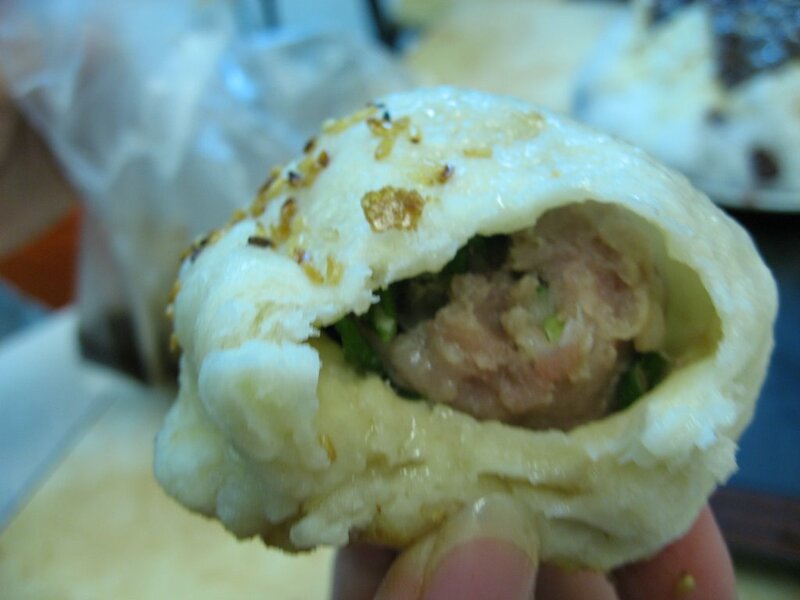 The ground pork is tender and juicy, so watch out for the juices dripping down your chin or to your shirt! 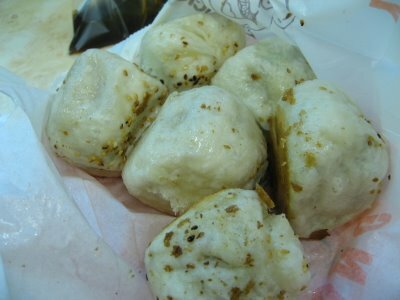 Jien bao or pan fried dumplings. Buy 10 get 1 free! I love shaved ice. I rarely find good shaved ice at the malls- instead you find it at the night market with the whirring machines and big blocks of ice and larger selection of toppings. They were out of some of my favorite toppings (rice mochi balls) so I opted for a red bean with evaporated milk (NT$40) and my cousin had green bean with evaporated milk (NT$40). When it was brought to our table, I was pleasantly surprised at how huge it was!! It's definitely enough to share with a few people and yes, it's just ice, but you'd be surprised the varying sizes of shaved ice you'll get for the same price at different places. There's something about the crunchy ice and the mushy beans and the overly sweet milk that combines into a irresistible treat. The ice here is shaved the way that I like- not too fine and not too coarse. 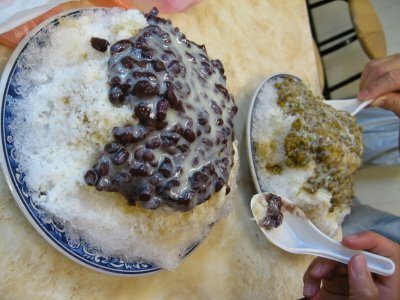 Some places have shaved ice that seem like you are eating the ice from your soda, and some have powdery ice that melts too quickly- this one falls somewhere in between. 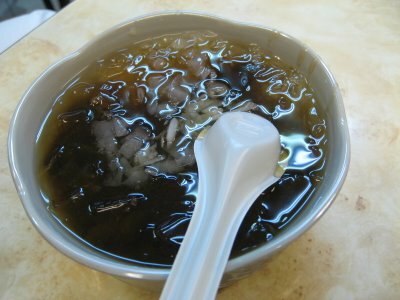 They also have aiyu bing or lemon jelly ice, with boba and extra lemon juice (NT$40). 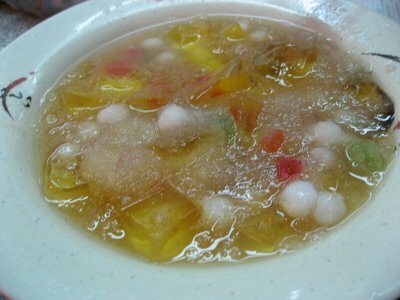 It's more soupy than like shaved ice and the extra lemon gives it an extra sour punch. You just wander around and navigate the crowds to find what you like. 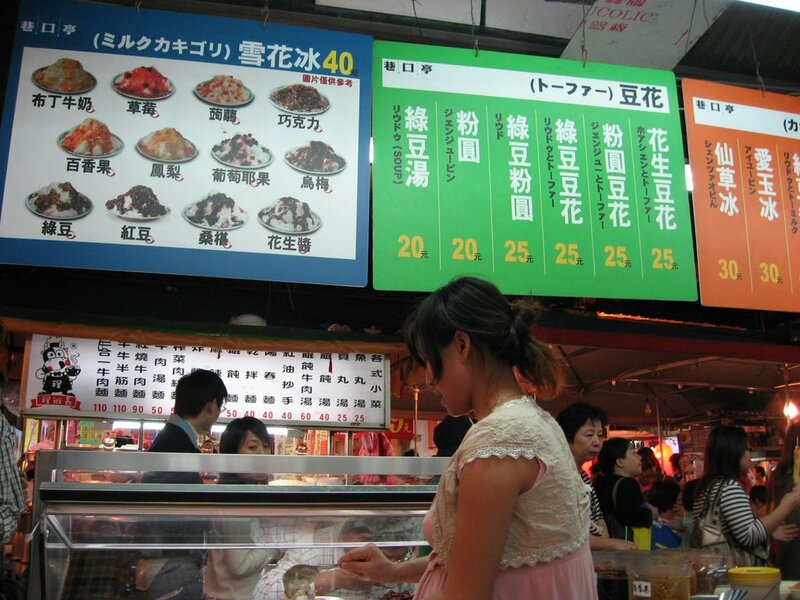 Since there's not a lot of English signs, but everything is on display, you can usually get by with just pointing and finger signs if you don't speak fluent Chinese. There's also lots of food on sticks, fruits, sausages, noodles, roasted corn and even a stand offering wraps made with freshly made naan and Indian flavored chicken, beef and lamb kabobs. 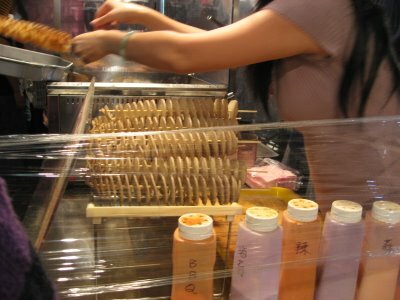 As the biggest night market in Taipei, it is PACKED on weekends, sometimes you can barely squeeze through the aisles through the people. But it's also a great place to go if you want to hang out- it's open late sometimes until 1am - 2am (but remember to head out earlier if you need to catch the MRT). 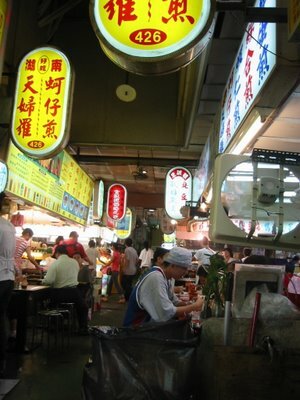 Some shops have a place to sit, but most of the stands in this area you eat and walk. If you need to sit down, head over towards the enclosed area. If you want to avoid the crowd, go during the day, on a weekday or earlier in the evening. Just exit the Jian Tan/Chien Tan MRT exit and look for the crowds- or ask the taxi driver to take you to "Shih Lin yeh sih." (yeh sih= night market!) 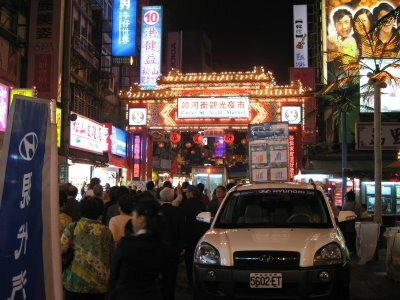 If you only have a few days in Taipei, definitely try and save one night to check it out! Does anyone else remember when they used to make fried apple pie in the US? It came in a funky shaped green cardboard box, with an warning in small print about how hot the filling would be on the side. The crispy fried goodness of a crust, the sticky sweet sugary filling and the bite-sized chunks of "baked" apple? It was probably one of my favorite desserts as a kid and suddenly McDonalds was health conscious and switched to baked apple pies with a stiffer, drier crust. 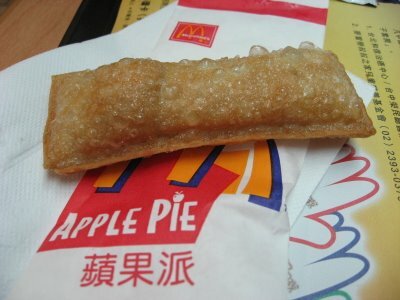 If you do remember and ever have a craving for it- they actually still make fried apple pie (NT$20) in Taiwan!! I think it was almost ten years ago we first started re-appreciating it in Taipei, and thankfully, it hasn't disappeared here like it has in the US. 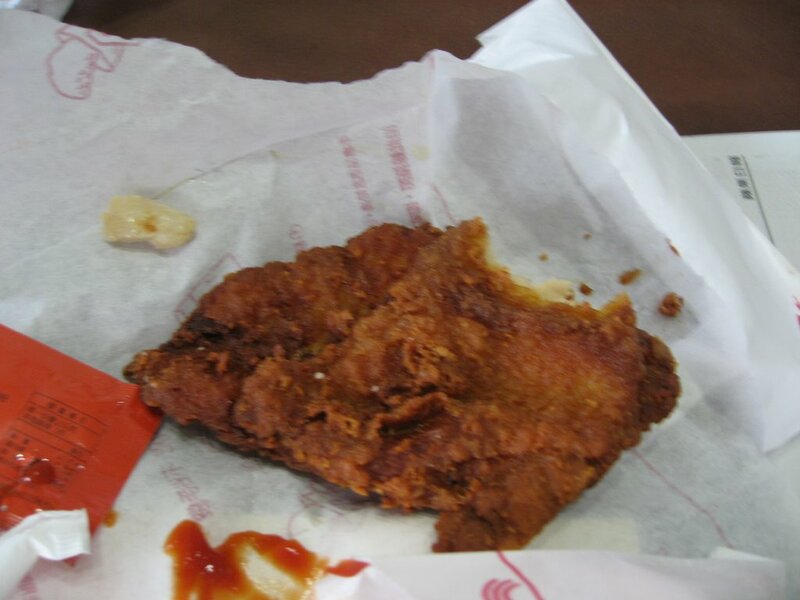 It's not the healthiest thing in the world, but who eats at McD's to be healthy? Although the portion seems much smaller and there's less apple in the filling, it's just enough of taste to make a good snack on the go. If you need something salty after eating something sweet, you can try their new steak fries. 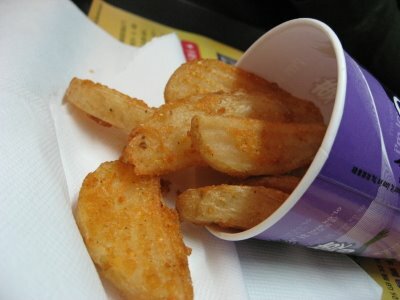 They are over crispy and fatter than their well-known fries, but don't provide the same satisfactory salty crunchy oomph. Stick to the original for the fries. 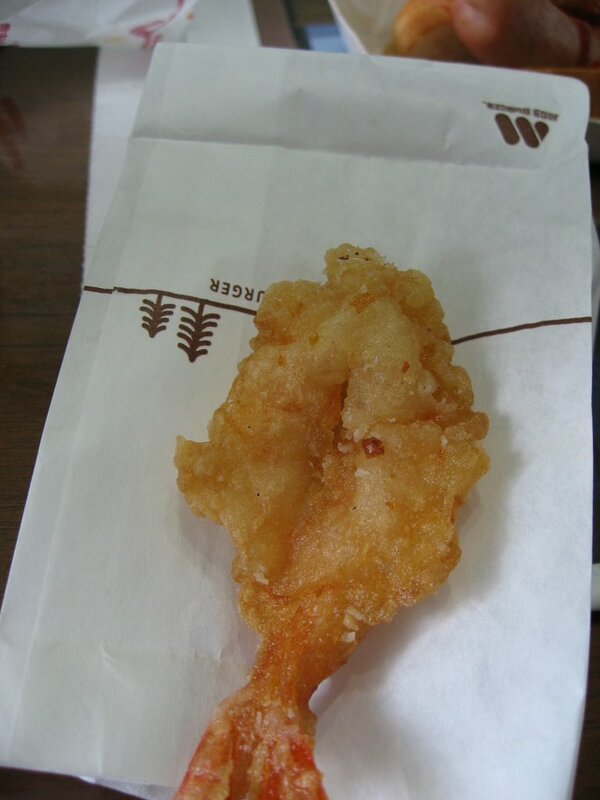 As for the rest, everything is pretty standardized compared to other McDonald's I've tasted in other parts of the world and on occassion, I like to eat a Sausage egg biscuit and hotcakes and hash browns. Mmm. I heard tha they might start serving breakfast all day at some McD's in the US. I've eaten a lot of tonkatsu. 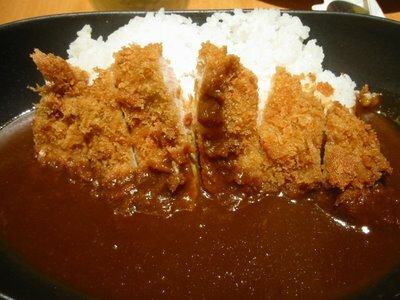 Most of the time, I thought, wow, that was pretty good tonkatsu. 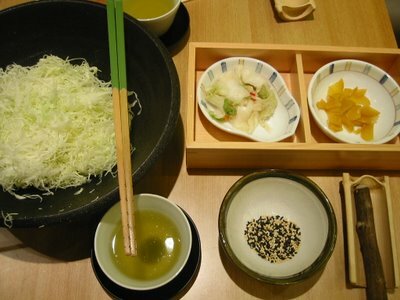 But after tonight, I felt like- you have not had the ultimate tonkatsu experience until you have eaten here! From waiting to get a table to figuring out everything on the table, to me, it was a little bit like unraveling a mystery. When we got there, around 8ish pm, there was a lot of people waiting outside. I went inside and asked how it worked- did I take a number? leave a name?- but it was pretty simple, you just "wait in line." I went back out and figured out where the end of the line was, along the wall with the row of chairs, and waited. And surprisingly, it moved pretty quickly. We probably were seated within 10 minutes of waiting after playing musical chairs- getting up and sitting down repeatedly, every time a new party was seated. You also order while you wait in line, so that the food comes a little faster after you are seated and drooling over the menu and trying to decide makes the time waiting in line seem like nothing. 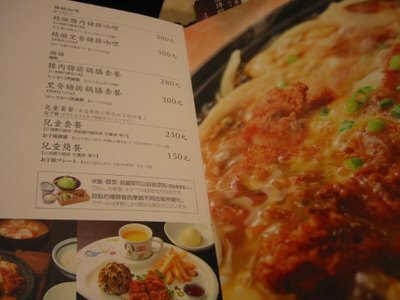 Unfortunately, the menu is ONLY in Chinese and Japanese. But it does have a lot of pictures and there are the pretty plastic models in the window near the entrance. 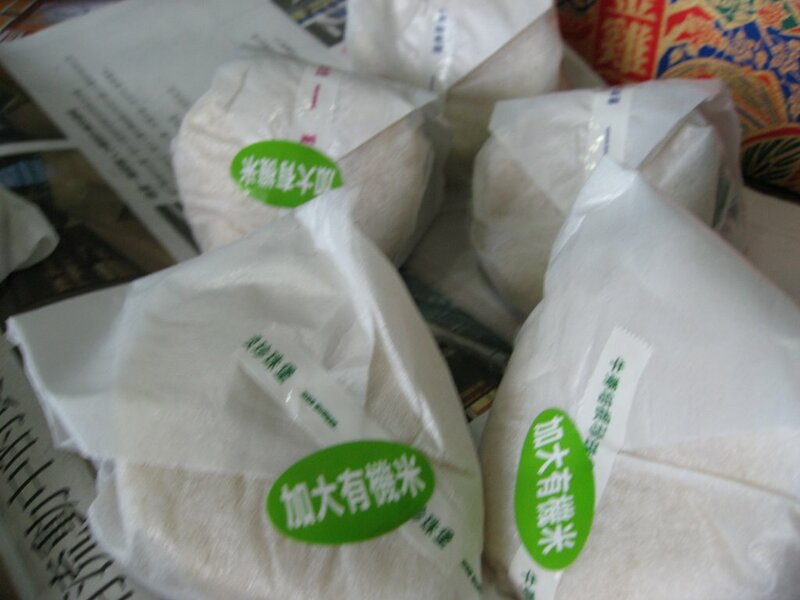 But I was still thankful to have someone who read Chinese with me because there were a lot of different selections. 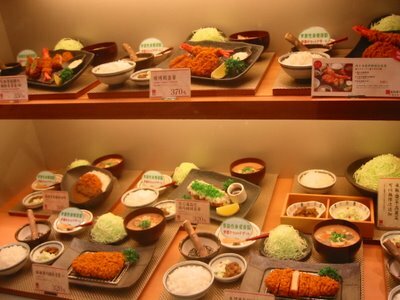 There were different cuts of the pork, there's plain tonkatsu, curry tonkatsu, mushroom tonkatsu, tonkatsu with cheese, tempura shrimp... lots of various choices and set menus. 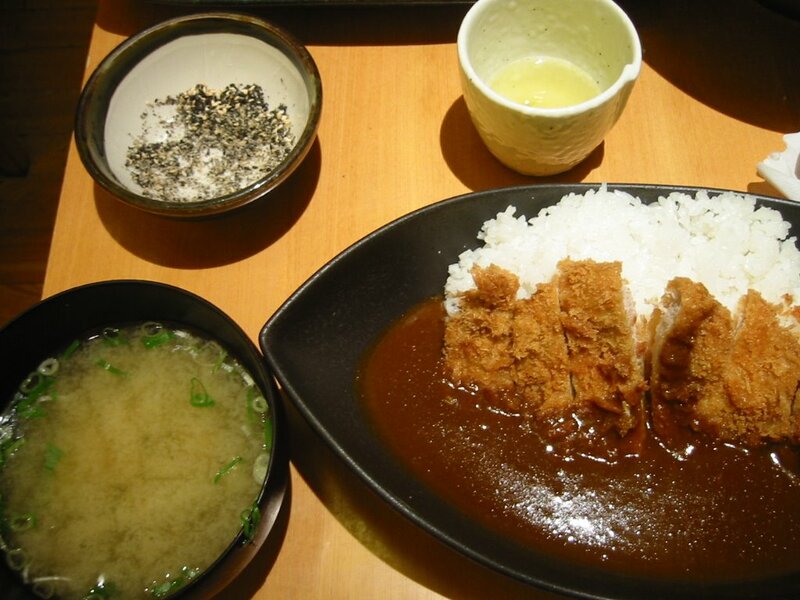 The average set is around NT$320-$390, so it's definitely more expensive than your average mall tonkatsu, but it's worth it! 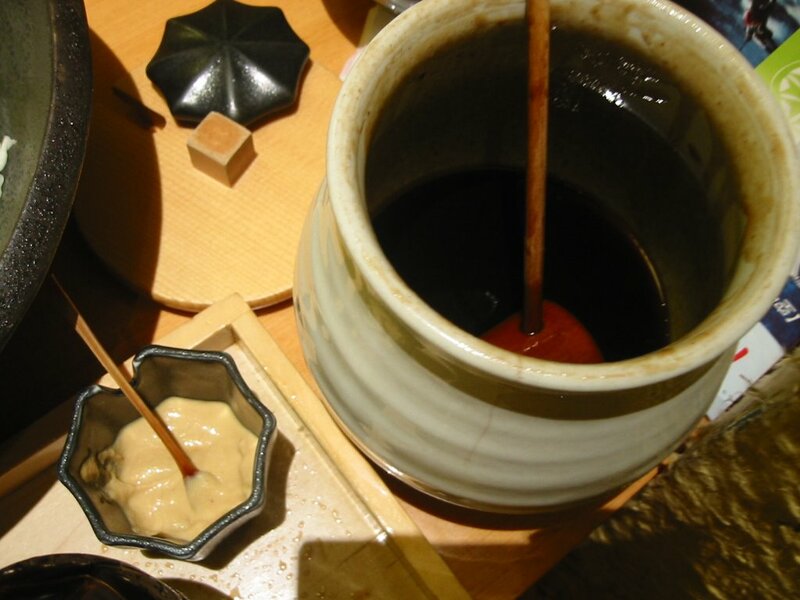 Once we decided- curry tonkatsu for me, plain tonkatsu for him, a set of deep fried shrimp to share- and we seated, I explored the various things on the table. I saw a small bowl of black and white sesame seeds, a short fat wooden stick, some dipping sauces and pretty quickly our free all-you-can-eat shredded cabbage came. what the heck is the stick for? 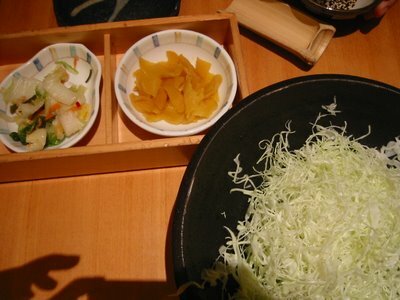 pickled vegetables and radish, and all you can eat shredded cabbage! 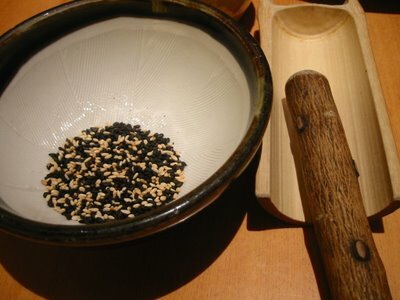 My friend had seen how to do it from a magazine review, so I followed his lead in using the stick to grind the sesame into the serrated bowl to add to the tonkatsu sauce. I asked my friend, Why? Can't I just add the whole sesame seeds over the top? He said, Smell the difference between your whole sesame seeds and my grinded up seeds. And to my surprise, there was a BIG difference. Crushing the seeds released a slightly nutty sesame aroma that aroused my palate. Mixing it into the tonkatsu sauce gave it a richer, deeper flavor that went well with the tender, perfectly fried cutlet. 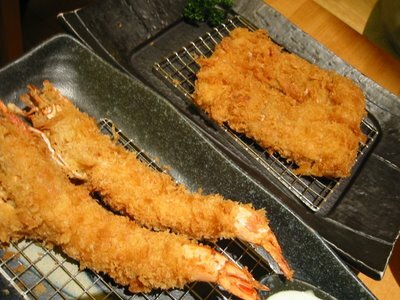 The tonkatsu is not greasy while being perfectly crispy. One cut of the pork is a bit leaner and drier, while the other cut is more tender and chewy. 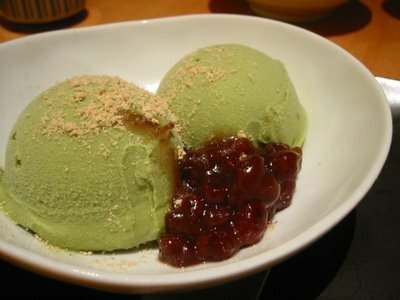 We ordered a dessert because we didn't know our set menus already came with a scoop of ice cream, otherwise we wouldn't have ordered it... but the green tea ice cream did have more interesting flavor. My friend said he had heard about this place for over 3 years, but we never made our way there. 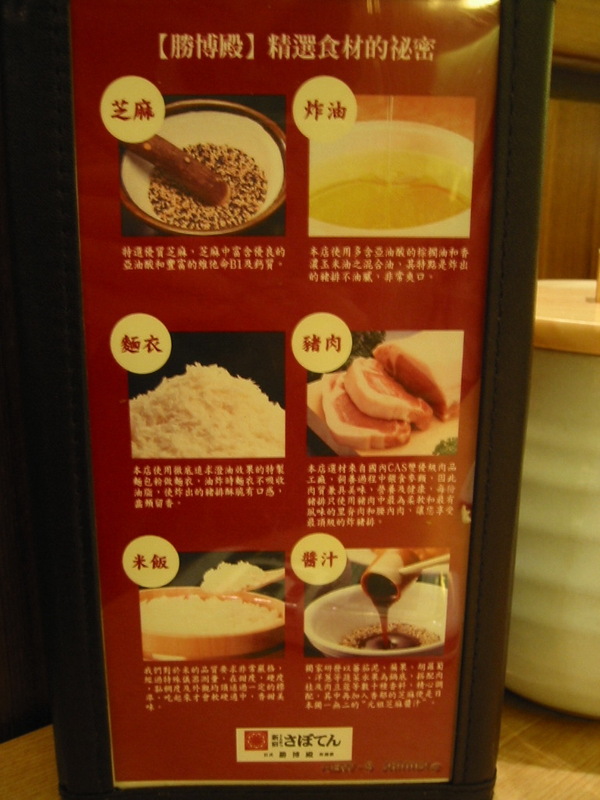 Then a few weeks later we discovered that there was another location at the Xin Yi Mitsukoshi and decided to try it at a later date. This time, we waited 45 (!!) minutes. Being seasoned customers, we went directly to the end of the line though it was hard to tell where it was since it was broken in a couple places. After waiting in line for about 20 minutes or so, we amused ourselves by watching the shock and surprise appear on faces of new people who tried to get a seat by going to the hostess and was sent to find the end of the line (which now snaked around all the way to the back near some elevators). The tonkatsu was still great, even though the experience was no longer new. 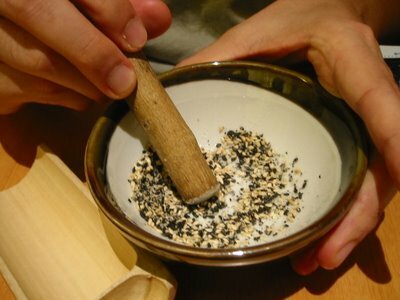 The service still efficient, the sesame still left to be ground by yourself. 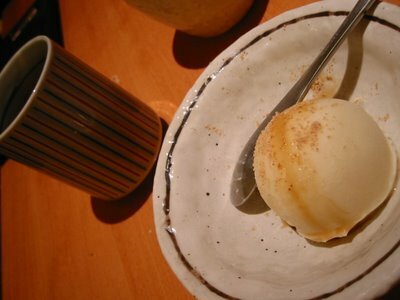 The only complaint I had is that the green tea ice cream that came with our set course was not freshly scooped, but pre-scooped and refrozen into an icy ball that no longer had that aromatic flavor. It's also weird that since eating there, I've heard about other people raving about it and about their rite of passage of waiting an hour or so for their japanese style fried pork. So take a magazine, your ipod, or have someone in your family hold your place in line while you shop, and head over to Saboten- just hopefully not on the day that I'm waiting in line.